CAMP LEATHERNECK, Afghanistan — Good morning, friends. Photographer James Lee and I are currently holding it down at this massive forward operating base and waiting on a few interviews. Over the next week or so, we’ll continue to offer up images and thoughts here on Battle Rattle from our time in Kajaki and Sangin districts with Marine infantry units. Up for discussion today: Taliban flags. Several times outside the wire, we observed that Marines pay attention to flags flown over compound buildings. They come in several colors, but the ones that draw the most attention are black or white. In Kajaki, Marines at Observation Post Shrine paid close attention to a compound that had a white flag flying overhead. It marked the building as Taliban friendly, said Sgt. Levi Steele, a squad leader with 1st Battalion, 8th Marines, out of Camp Lejeune, N.C. In the Upper Sangin Valley, flags came up again. Marines at Patrol Base Watson handed 2nd Lt. William McCabe a black flag last weekend that they had seen a child playing with in a nearby field. They traded the boy a few of pieces of candy for the flag, Marines said. 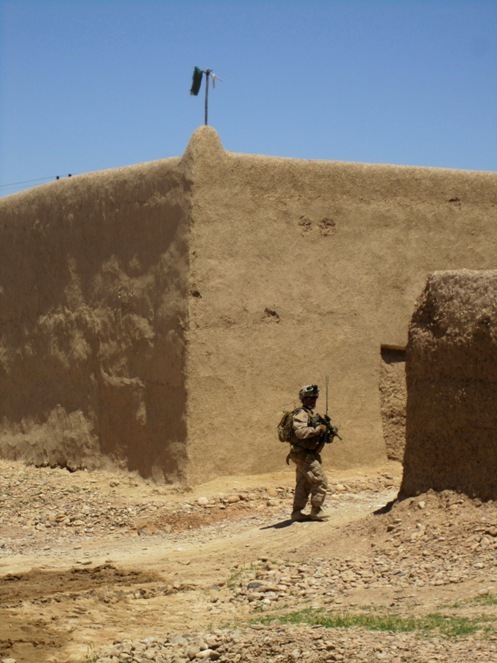 White flags in Taliban country typically mark insurgent safe havens, said McCabe, a platoon commander with 1st Battalion, 7th Marines, out of Twentynine Palms, Calif. Black flags are frequently a call to arms — an order to come out and fight, essentially. We also came across the green and white flag depicted in the photograph here in Sangin’s volatile “Fish Tank” area this week. The 1/7 Marines on patrol with us that day were uncertain what it meant, but their interpreter told them green flags can be used to mark buildings occupied by new inhabitants. It was unclear if it was Taliban-related or not.